Following is a statement by Karu Jayasooriya on the occasion of the 60th anniversary of the United National Party which falls today. ADDRESS: Today we commemorate the 60th birth anniversary of the United National Party. It was on September 6, 1946 at 5 p.m. the inaugural meeting of the United National Party was held at 'Palm court' in Albert crescent, Colombo. D.S. Senanayake who took the chair at the invitation of the convener of the meeting, Sir John Kotalawala, explained the aims and objectives of the Party. At this inaugural meeting he emphasized the importance and the need for unity among all the communities residing in the island. He also appealed for goodwill and mutual trust among all communities and expressed hope that the United National Party will be a strong political force in the country and will play a great part in molding the future of the nation. Symbolizing the commitment to these noble ideals the first resolution to establish the United National Party was moved by S. Natesan and seconded by T.B. Jayah., which followed the resolution of the manifesto and the constitution of the party. That again was moved by Molamure and seconded by A.R. Razik. What was clearly evident from the above act was the recognition of the fact that 'unity amidst diversity' should be the guiding principle for the party and the nation at all times. Those ideals infused life blood for the party. Therefore any deviation from such ideals would make the United National Party sterile barren and non-functional. We have been in office for more than thirty years and nineteen years in opposition. The day that we commemorate the birth anniversary of the party in my view provides a good opportunity for us to reflect on both our achievements and failures and to think of what our future course of actions should be. This year such reflection become all the more important as we commemorate this event not as a Party in government but as a party in opposition, yet one that represent the aspirations of well over a 4.5 million of people in Sri Lanka. Therefore it would be pertinent to raise a series of questions in a soul searching manner to ascertain whether we have been able to live upto the expectation of the founders of our Party and where we have been successful and where we have gone wrong. There is no disagreement on the fact that the United National Party even after sixty years remains a formidable force in the country's politics. It still remains the single large party capable of forming an alternative government at any given time. Moreover it remains the safest and acceptable political base for a community with ethnic and religious cultural diversity. Even in the face of defeat we as a party have not succumbed to ethnic, religious or ideological extremism for the sake of gaining power. Amidst political victory or defeat it has stood steadfastly to the ideals of the creators of this great political force. At this point let me quote what D.S. 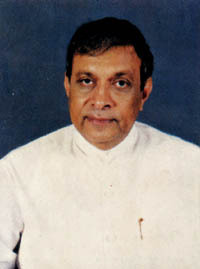 Senanayake said in his opening address on September 6. He said that "The constitution, with which this island has been endowed requires a government backed by a firm and disciplined majority. It also requires a strong party. We are not as our opponents wishfully think a temporary coalition for the purpose of winning seats at the first election. We are a permanent organisation designed to act on a constitutional policy in the House of Representatives whether as government or opposition.
" These sentiments expressed by founders of our Party certainly cast upon us a great responsibility in governance. Even as a party in opposition we can be proud of being able to uphold most of these values in the face of adversity and to be the members of a political party that has created an unprecedented record on social, political and cultural development of the country. The first wave of development in the post independence era was initiated by the then Prim Minister D.S. Senanayake who ventured to develop the dry zone which was neglected and left for ruin by the British rulers. He foresaw the potential of this vast area which once was the cradle of Sri Lanka's enviable civilization. Thus began the restoration of tanks and irrigation systems in the rural hinterland making it once again habitable for people. He engineered a revolution in agriculture with the giant Galoya and Udawalawe projects and the ancient irrigation tanks of Kantale, Padaviya, Huruluwewa, Kandalama, Kawdulla, Girithale and Parakarama Samudraya being restored to its former glory. He brought back the pride and progress to the country which was traditionally agrarian. Mass migration induced by this massive development efforts by DS once again brought large tracks of land in the dry zone under the plough paving way for the rebirth of a new civilisation in this area. It was his visions that made universal free education a reality which in turn laid the foundation for a nation with high literacy and intellect, a necessary precondition for a working of a democracy and a progressive nation. By introducing free education the UNP shook the very foundation of privileged few and created opportunities for rural youth to reach position of prestige in public administration, engineering, medicine, law and financial management among others. Today we take pride in our human capital with its superior knowledge skills and quality clearly attributable to this farsighted vision of our past leaders. Following his father's foot steps Dudly Senanayake, initiated the 'Green revolution' in the sixties to make the country self-sufficient in food. He walked along vast stretches of paddy fields, talking to farmers and villagers, getting closer to their lives in order to understand their real problems. His approach to issues were influenced by those experiences. He is still in our memory as the 'Bath Dun Piya' the father who fed the nation. He exemplified 'gentleman politics' which still has a great influence on us. Sir John Kotalawala a man with great stature contributed in great measure for the development of the country by taking initial step for tapping the hydropower potential in the country. And constructing a road net work. The Bandung conference which he took great interest though ridiculed by some of his political opponents later grew into a formidable political force as non align movement. The second wave of development was the one that ushered by Late President J.R. Jayewardene in the 1977 era by resurrecting a virtually ruined economy with his transformational economic and social policies. The open economy enunciated by him demolished the fortress of bureaucratic controls and restrictions and set free forces of the market economy to create wealth for the enterprising citizens. It was during this second wave that steps were taken to create a modern day hydro civilization by constructing large number of man made reservoirs, creating human settlements, with a touch of modernity and ushering an era of socio-economic revival in the country. The Mahawali Development project saw the work on four huge dams commencing in quick succession with completion accomplished in six years. Vast stretches of arid lands in the dry zone once again was brought under irrigation. We saw the birth of a modern sea port with technological prowess which could compete even with its counterparts in the Asian region in maritime business. Millions of unemployed rural youth both men and women found gainful employment in the modern industrial sector. Industrialization accelerated as free trade zone opened up with streams of foreign investors pouring in capital bringing in machinery and providing the state of the art of technology. Improved communication supported the success of an open economy. The world revolution in telecommunication technology was drawn into Sri Lanka with introduction of mobile cellular phones and networks. Media freedom received special consideration and it was the UNP government that opened Sri Lanka window on the world with the introduction of television. President Premadasa who was committed to pro-poor development policies made it possible to ameliorate some of the adverse effects of the economic liberalisation programme that was made necessary by the changing global circumstances. Millions of people who enormously benefitted out of these programmes still express their unreserved gratitude to him. Late President Premadasa is still remembered for the massive housing development and the poverty alleviation programme which was implemented under personal guidance. Those programmes which received even international recognition are still considered models worthy of adoption. He is more particularly remembered for initiating a rural base industrial development programme bringing benefits to rural youth. The third wave of development under the UNF government under the leadership of Ranil Wickremesinghe in 2002 was about to be unfolded with the initiation of the peace process. An economy which was in doldrums with a negative growth, massive internal and external debt, and economy under siege by terrorist attacks was gradually revived and resuscitated and the government was once again able restore the lost confidence on the country. It was a brief period of renewed hope and expectation for the country. As a result of the ceasefire agreement there was a respite for the 30-year war and the government was able to bring the worrying fraction to the negotiating table and work towards a negotiated settlement. In spite of various allegations levelled against the ceasefire agreement by extremist elements, what I believe is that this is the single opportunity in the recent past that we all could have got together to work towards a lasting solution to this national issue. It is undoubtedly a lost opportunity. Unfortunately the government's efforts were subverted through a constitutional conspiracy, and today the country is once again dragged into a war situation rendering thousands of families homeless, with refugees in their own country. While we do not want to make any critical comment on the approach to the national problem by the present government we appeal to them to be concern about the human misery that has been brought about by the resumption of war and to take every possible action to minimize the agony and bring peace. We in the United National Party do not believe in a military solution to the national issue. At the same time we will never compromise on the indivisibility and territorial integrity of the motherland of ours which belongs to all communities. We totally and out rightly condemn the atrocities committed by the LTTE and other armed groups. We have very clearly expressed our view points on these matters. It was the leaders of the United National Party along with patriots from the other communities who fought for the independence and the sovereignty of the nation. We don't need to look for new 'ideologies' 'isms' to any of our problems. We still can draw inspirations from our founders who put the interest of the country before self interest. As the political history bear evidence for D. S Senanayake the 'Sri Lanka polity was one and indivisible. Need for generous concessions to the minorities for him was much more than a matter of political realism'. This thinking was well reflected even in the drafting of the Soulbury constitution. It was further reflected in the formation of the United National Party. It was designed to make a fresh start in politics in the direction of consensus of moderate political opinion in the national interest. Though it was to be a political party necessarily representative of the majority community it was to be acceptable to all other communities. While these cherished ideals would guide us in seeking solution to the national issue today it may require redefining some of these concepts in the light of the complexities of the problem that has developed over the years. It was with such understanding that the United National Party brought about several fundamental changes through amendments to the constitution, thus introducing the concept of devolution of power. This we firmly believed as a necessary pre-condition for solution to the ethnic issue. Devolution of power in its true sense, with restoration of democracy through good governance, equality in opportunity for sharing the benefits of progress by everybody irrespective of race religion and language we believe is the way forward for the country.